Stowaway Pack Special for December- 15% OFF!!!! EasyCare is offering our Western and English Stowaway packs at a 15% off sale through December 19th at our website. The sale is good through 12:00 noon, so that we can get all orders shipped out before the Holiday Season. Go here to see our great color variety and special features about these great saddle packs. What a great way to show the holiday spirit to your friends and riding buddies with a special gift! Sale is good on website orders only, no quantity limit and good on these part numbers only P9-STWES and P9-STENG. Just insert the Promo Code: PACKS and the discounted amount will show on your order total. The EasyCare web special for October is purchase 3 Easyboots any size (a pair and a spare) and receive an EasyCare Gear Bag free! The gear bag ( a $20.00 value) is perfect for holding your Easyboots as well as grooming aids, horse blankets etc. You must add the gear bag as one of your items and enter the promo code "SPARE" on the same line as the gear bag. This offer ends October 31, 2008, so hurry while supplies last! Have you ever gotten back from a ride, removed the boots and wondered how to clean the Velcro? Our warehouse personnel have been using a simple cat brush (their own Velcro Cleaner) on the Velcro to remove grass, hair and whatever else is stuck. They use it on both the hook and loop sides of the Velcro. This can also rejuvenate that loop side as well. If you have seeds or small sticks still stuck in the Velcro, try using a steel brush. A little metal brush just a bit bigger than your toothbrush works wonders as well. 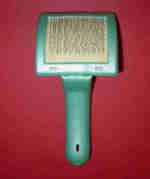 So go to your local pet shop and pick up your cat brush to clean your Velcro. You can use it on the gaiter for the Easyboot Epic, Easyboot Bare, and Easyboot Grip. The best one to use it on however, is the Old Mac or Old Mac G2. Don't forget that the Ice Boots and the Stowaways also have Velcro and this helpful tip can be used on them as well. 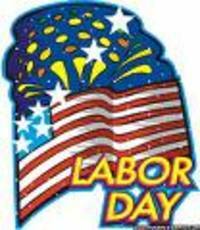 EasyCare offices will be closed in observation of Labor Day, Monday September 1 and will reopen September 2, 2008 at 8 a.m. MST. It's the end of summer and time to hit the trails again, now with cooler temperatures. Be sure to pack plenty of water and all your needs in our easy to use stowaways. Have a great and safe holiday from all of us at EasyCare. 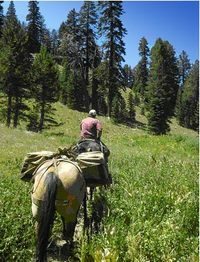 Here is a great link to some real adventurous hiking, mountain biking or horse back riding on the Tahoe Rim Trail. For specific information on each trail segment and helpful information for where to park your horse trailer for instance, it is recommended to purchase "The Tahoe Rim Trail" that gives you a complete guide, by Tim Hauserman. Be sure to pack all your needs from hoof boots to stowaways and be safe. Here are the answers to yesterday's puzzle. How well did you do? 8. What boot accessory can be installed to increase traction? 14. How many compartments are in the Deluxe Stowaway? 16. What item is optional on the stirrups? 18. What is Bernie's mules name? 1. Which boot uses technology found in snowboard boots? 2. The Old Mac is only recommended for a maximum number of mileage per week or ride. 3. What state is EasyCare located in? 4. What is the last name of the EZ ride stirrup inventor? 5. 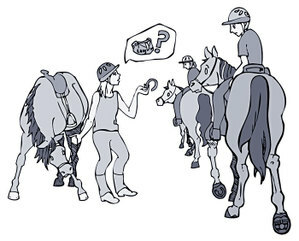 The Easyboot Epic and Easyboot Bare are used mostly by what type of rider? 6. What city is EasyCare located in? 12. What is the first name of the inventor of the Easyboot? 15. What is the largest size of the Easyboot Bare? This is just for fun. No contest at this time but see if you can answer all the questions. A little EasyCare Trivia to help pass away the time. I will post the answer to this crossword tomorrow. It's that time of year again for the 54th annual Tevis Cup Ride in Auburn, CA. This year's 100 mile-one day endurance ride is being held July 19th, 2008. If you would like more information about this challenging ride that has been the inspiration and model for endurance rides around the world, click here. If you are planning on attending the ride, be sure to look for vendors selling a variety of EasyCare products. Our EasyCare dealers will have products such as Easyboot Bares, Stowaway packs and EZ Ride Stirrups available, just to name a few. It's that time of the year folks! Let's get our horse's booted and out on the trail. There are several types of hoof boots to choose from here at EasyCare or choose a dealer near you. If you are new to boots here is a great link to show you how to measure for them correctly. You must not forget to carry plenty of water, so check out our stowaways for a quick and easy way to access all your pack needs. There are some great trails to head out on, and the weather is great here in Tucson. 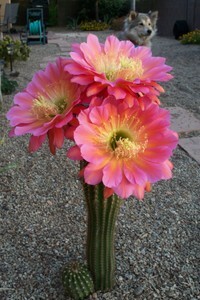 Lola thinks so too as she gazes at the beautiful blossom on one of the cacti in her yard. Help Dad Have an Easy Carefree Father's Day! Father's Day is just around the corner and EasyCare can help make the day really great for that special dad in your life. What dad would not love a pair of EZ Ride Stirrups? How about one of our durable, waterproof Stowaway packs that come in 7 great colors? Dad might also like one of our luxurious Shear Comfort sheepskin saddle covers made from merino wool, which is the thickest, softest and most durable sheepskin in the world. Our website has numerous gift ideas from nitrile gloves to hoofjacks! You can call us at 800-447-8836 to place your order or you can order directly from our website by clicking here. So many reasons to pick up horse back riding as a hobby. Just think, not only is it great fun, it is plain good exercise to firm up abs, tone legs and increase balance and coordination. Having a horse life is connecting with the best human friends you'll ever know, watching your kids grow up with goals, teaching them about having a plan, and working hard to achieve those goals in life. Read this great article on all the fun things you can do with horses, we at EasyCare are ready for some riding time aren't you? If you need any riding accessories such as packs we have a great line of stowaways to choose from. See you on the trail! 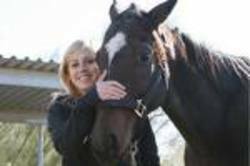 This important article on snake bites was recently posted on the Horse Health web page. It is that time of the year so horse owners beware, and above all seek the advice of your veterinarian immediately if your horse is bitten. EasyCare also suggests you carry vetwrap, gauze, syringes, and anti- inflammatory medication prescribed by your vet in your packs for easy access. defensive type of bites with little or no venom injected by the snake. bite is not a good idea, nor is a tourniquet. Online shopping has increased since the Internet became part of the modern world, and EasyCare has just what you need for that great gift. Not only do we have hoof boots ,but we also have Stirrups, Shear Comforts, Stowaway Gear, Packs, Videos, and Apparel. There are also some great stocking stuffers such as boot accessories and comfort pads. Want to be able to give a special boot, check out the Custom Boots available thru the Internet only. If you purchase 4 or more boots (Bargain Bin and Custom Boots excluded), a quantity discount will apply. Since the Old Mac's and Boa Boots are sold as a pair, this is considered 1 boot. Mix and match your boots to still receive that quantity discount. For example, buy 2 Easyboot Epics for your own horse and two more Easyboot Soakers for your best friend and get that quantity discount! 4 or more boots must be purchased at the same time from EasyCare to be eligible for a quantity discount. Don't know what to get, simply give us a call at 1-800-447-8836 and request a gift certificate be sent to you or directly to the individual of your choice. Please remember to shop early since EasyCare will be closed for the Holiday Season from December 22nd thru January 6th, 2008. We will be back to service all your needs on January 7th, 2008. The Stowaway Packs have arrived! With the holidays coming soon be sure to place your order by calling EasyCare or visiting us online for quick and easy shopping! Our Stowaway line is the most advanced innovation in "no-bounce" saddle pack design. Maximum storage with minimum bulk, these packs work for every type of riding style. Several compartments allow for better organization and easy access to what you need when you need it. All Stowaway Packs feature 420 Ripstop with waterproof urethane backing and are available in seven different colors. These packs make great gift ideas for your favorite riding partner or friend! Happy Holidays! Carry an Easyboot or get a sense of Humor. This was one of Easyboots slogans when it came to losing a shoe, however, it still applies today. Be sure to pack an extra Easyboot whenever you go riding. A lot of rider's miss out on finishing a trail or even starting their ride due to a lost shoe. Having to wait for someone to come and nail the shoe back on can be frustrating as well as expensive. Carrying an Easyboot prevents frustrations over losing a shoe and could help prevent lameness or health issues with your horse. Wouldn't you want to make sure that your transportation, whether one horse power or your 166 horse power gas vehicle had a spare tire? You can always carry your spare tire conveniently as well in our Horse Boot Stowaway. P.S. Enjoy this graphic from our own Jessica. Western, English and Endurance saddles. The best one is yours when you participate in our Contest. EasyCare has a contest going on and this is just not for the boots. You can send us your testimonial on any EasyCare product. Today, let's find anyone out there who uses the Easy Care Stowaways. Take a picture of your saddle with your Stowaway attached and send it to us. Make sure you let us know which saddle you are using. Someone might have the same saddle and you could show yours off with a Stowaway attached. Tell us why the Stowaway works for you. Have helpful tips on how to make sure you get that no-bounce? Go ahead and include that as well. We'll send you a free Get A Grip T-shirt if you are one of the first 25 responses. Make sure to include a valid E-mail address and your photo. Submit your Stowaway testimonial at this link.